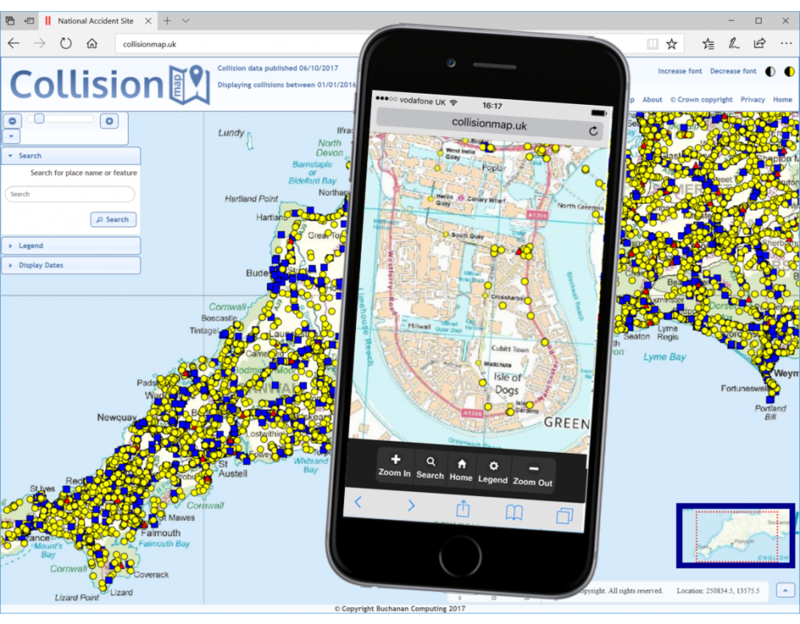 CollisionMap is a free service that displays and gives details of road accidents that involved an injury or fatality for the whole of Britain. It is based upon Ordnance Survey mapping and has a detailed gazetteer to find the location you are interested in, and a number of unique selection and display features. It always shows accident locations even when zoomed out, giving a full indication of safety issues over a large area. This is particularly useful for rural locations or looking at whole authorities. It currently has details of injury accidents that occurred during the years 2011 to 2017, and this will be updated again immediately 2018 data becomes available. CollisionMap is based upon our Traffweb web mapping tool, a system supplied commercially to many local and police authorities. It is totally free to use without any need to register, and is provided by Buchanan Computing as a pro bono service to the community to promote road safety.